Over the next few years you will find that your conversations with designers start with more challenge, and continue with more ease. That’s because design practitioners are wising up. They’re asking strategic questions even to the point of discomfort, and nurturing their client relationships once an effective partnership is in place. They’re collaborating with each other, as well as with you; they’re focusing on outcomes, not just aesthetics. This solution-mindedness and affability will come at the price, to you, of more demand for transparency and equality. The agency landscape has grown to have more small agencies, many turning over under a million and run by people with a passion for design – often quite a niche aspect of the trade. Many of them will have made it through one or more recessions and are looking ahead to another with trepidation. What that is forcing people to do is to sharpen up. 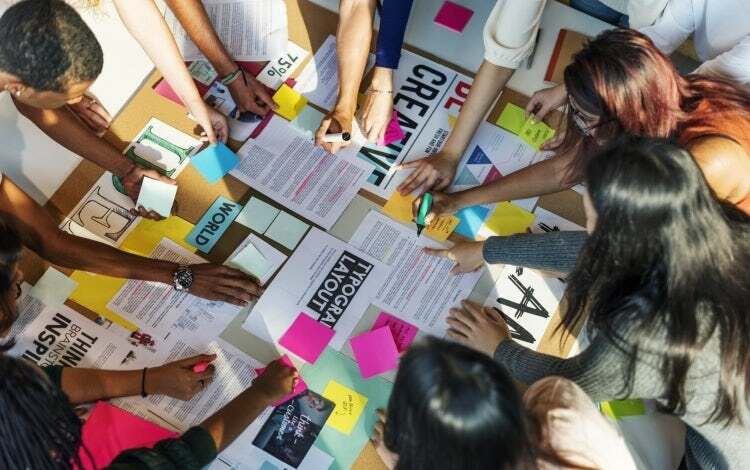 Organisations like the Design Business Association and client-agency intermediary AAR field experts to packed rooms of design agency heads, advising them on evaluating client expectations, stepping away from the subjugation of the pitch and expressing their value. The narrative is about design at the board table; as a function of business growth; as an answer to failings in British education, politics and reputation. Consequently, the agencies you deal with are becoming more businesslike. This increasing commercial awareness manifests itself in two main ways: one, their approach to work, and two, their approach to client relationships. In addition, the growth of in-house practitioners has cut away a lot of the tactical work that agencies used to churn through. This has forced agencies to reposition themselves, which, as pure design becomes increasingly commoditised, leads them into a more strategic space. Naturally, if you want the traditional agency model, complete with creative director rock star, you’ll find plenty of them around – confidence is a great pitch winner, and there’s indubitable talent in many of them. But there’s less space for them, and they’ll get rarer. Talk to designers and you will eventually get to creative solutions, craft and the finer details of application. But increasingly you’ll find the conversation starting with objectives, insights and targets. It’s surprising how many clients still don’t match a financial return to their investment, but more agencies will ask for it. How else would they measure the effectiveness of their work? In fact, effectiveness is what a lot of this boils down to. Designers understand that, if their work is to be taken seriously – if it is to have a chance of sitting at the board table, changing perceptions and impacting national reputation – they need to be able to articulate how well it works. The easiest way to do that is to set a goal from the off. Agencies are increasingly questioning briefs. As a starting point for a programme of work, written instructions are great, but British agencies are coming round to the American way of writing the brief for the project themselves. I’d always rather have a businesslike conversation about your problem as the starting point, and then build understanding through a process of questioning and research. The brief, generated by the agency, is a client’s safety stop – a great way to know early on that the designer understands your challenge and has the wisdom and creativity to address it. At this point, no ‘design’ has happened. Design thinking, design process, yes; but no graphics. At this point, you can walk. So can the agency. There is a common understanding that client-agency relationships last two years, three years tops. And there’s a lot to be said for shaking things up. But alongside focusing on strategy before tactics, agencies are learning to be far more understanding of their clients’ wants as well as their needs. Riding roughshod over a brand manager’s day will endear a designer to no one, and ultimately it’s the agency that gets fired. As we’ve established, this galaxy of agencies is keen to find some stability, so they’ve got to play nice. Empathy is a much-maligned word. It’s seen as soft, non-corporate. But the truth is that great design is full of the stuff. Empathy is insight to audience motivation, it’s the psychology of response. It’s also at the heart of good client relationships. While the era of the long, boozy lunch might be way behind us, expect your agency to work hard to recognise your personal objectives, to mitigate your worries and to support your reputation in a project. A relationship where the client is completely open with the agency, and where the agency respects that and focuses fully on meeting their corporate and personal objectives, is a successful relationship. Just as agencies are accessing more advice on their own positioning, they’re increasingly curious about clients’ hidden needs. This bodes well for long, productive relationships that really deliver the goods. In seeking your next design practitioner, you’re going to find fewer ‘design’ or ‘brand’ agencies. Even ‘digital’ as a category is dying out. That’s because these things are entry-level requirements. Increasingly the language is of consultation, communications and growth. Tap the shell and you’ll still find people who take real joy in creativity, in ideas, in disruption, in craft – but this time, they’re kicking those things off with business thinking, and delivering them with a careful eye on your equilibrium. There’s never been a better time for us all to work together. This changed world is rife with opportunity, equality and progress for all of us who are flexible enough to embrace it. If only the same were true of politics. This article was originally written for Marketing Week, which you can find by following this link.